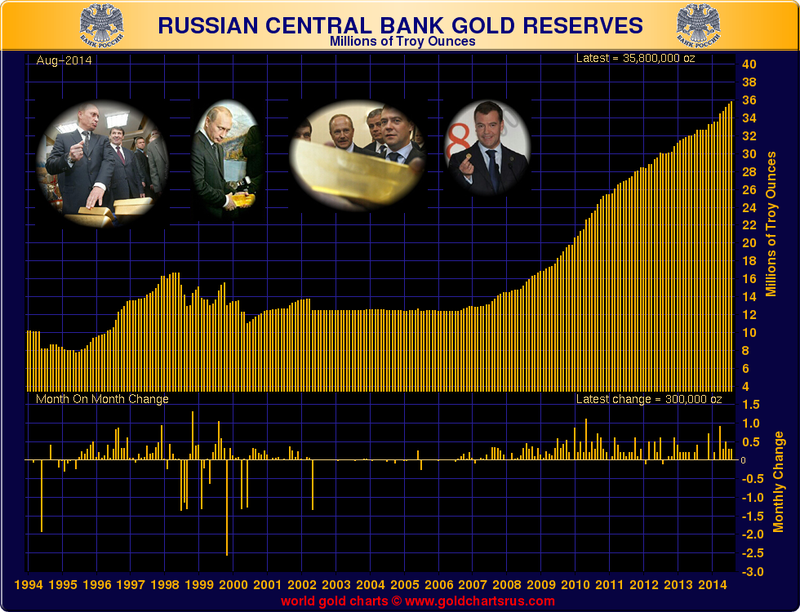 Latest official gold reserve data from the International Monetary Fund (IMF) shows that Russia again added to its gold reserves in August, with the Central bank of the Russian Federation purchasing 232,510 ozs (7.23 tonnes) and bringing its total gold reserves to 35.769 million ozs or 1,112.5 tonnes. Likewise, the National Bank of Kazakhstan purchased a massive 795,213 ozs or 24.7 tonnes in August bringing its total gold reserves to 5.848 million ozs (181.9 tonnes). Turkey was also a gold buyer in August and the Turkish central bank adding 96,783 ozs (3 tonnes) to bring its total official gold reserves to 16.45 million ozs (511.6 tonnes), which is the world’s 12th largest official gold holding. According to the IMF data, other countries which added to their gold reserves in August included the central banks of Azerbaijan and Ukraine. With the ongoing conflict in Ukraine, its not clear where the official Ukrainian are now stored. There had been reports in March that the Ukrainian gold was flown out of Kiev to the Federal Reserve Bank of New York, but neither central bank would comment on this issue at the time. Kazakhstan now has the world’s 23rd largest holdings, just behind the Philippines which has 194.4 tonnes of gold reserves. With 1,112.5 tonnes, Russia remains the world’s 6th largest official gold holder, ahead of China (1,054.1 tonnes) and Switzerland (1,040 tonnes). The Swiss National Bank (SNB) has not been a gold buyer recently but this may change if a Swiss gold referendum to be held in November goes through, which would force the SNB to maintain 20% of its reserves in gold and to repatriate all gold held abroad back to Switzerland. As we pointed out last month, as well as being a reserve diversification strategy, the ongoing gold accumulation trend by both Russia and Kazakhstan could be part of a coordinated monetary policy since the two countries are members of the Eurasian Customs Union along with Belarus. Next year the three countries plan to turn this Eurasian Customs Union into a more formal Eurasian Economic Union. Coordinated accumulation of gold reserves would make sense in this context. Russia, Kazakhstan and Belarus are also members of larger regional cooperation organisations, namely the Eurasian Economic Community and the Shanghai Cooperation Organisation (SCO). It will be interesting to see what a pooled gold holdings total for Russia, China, Kazakhstan, and other SCO members will look like when China finally does provide the world with an update on its official gold holdings. Yesterday, the UK Treasury announced a consultation review into widening UK financial benchmark legislation and make manipulation of key currency, precious metals, and interest rate benchmarks a criminal offence. The only benchmark that is currently regulated is the interest rate LIBOR benchmark. HM Treasury plan to add a further seven key benchmarks to the legislation. These benchmarks are the WM/Reuters 4pm London fix (currency), ISDAFix (interest rate), the London Gold Fixing benchmark, the new LBMA Silver Price benchmark, the ICE Brent futures contract (crude oil), and two index swap benchmarks called the Sterling Overnight Index Average (SONIA) and the Repurchase Overnight Index Average (RONIA). The London Gold Fixing process is in disarray after multiple claims of manipulation and the prosecution of Barclays by the Financial Conduct Authority (FCA) last May for manipulating the gold price in the fixing auction. The London Gold Market Fixing Company (LGMFL) and the London Bullion Market Association (LBMA) are now attempting to ‘circle the wagons’ on regulatory compliance and investor litigation by moving to a new LBMA Gold Price process modelled on the recently introduced LBMA Silver Price. The LBMA Silver Price auction has not really evolved in any way since being introduced on August 15, and its current ‘phase 2′ stage, by design, only allows bullion banks and brokers to participate due to the lack of a central clearing counterparty and limitations on bi-lateral credit lines for auction participants. However, this has not stopped the LBMA ploughing ahead with a similar plan for the gold fixing process which still has the CME Group and Thomson Reuters as the leading contender. With the London gold fixing process being so central to the determination of the world gold price, any moves by the UK authorities to criminalise manipulation of the gold fixing price are welcome. Today’s AM fix was USD 1,210.50, EUR 950.61 and GBP 742.05 per ounce. Yesterday’s AM fix was USD 1,224.00, EUR 952.87 and GBP 746.11 per ounce. Gold fell $5.70 or 0.47% to $1,217.20 per ounce and silver slipped $0.10 or 0.56% to $17.70 per ounce yesterday. Spot bullion in Singapore slipped 0.3% to $1,213.60 an ounce by 0043 GMT, after losing 0.5% in the earlier session. Gold is close to an 8 1/2 month low of $1,208.36 reached earlier in the week. U.S. Mint September American Eagle gold coin sales are almost 50,000 ounces, nearly twice its sales in August, with heightened geopolitical risk and a cheaper bullion price contributing to the interest from investors. If further bullish U.S. economic data comes out this week it will strengthen the U.S. dollar and weaken gold’s appeal, as investors think the U.S. Fed will react with an earlier than expected interest rate hike. This entry was posted in news and tagged currency wars, fed policy, Financial Crisis, gold price supression, mark o'brien, market manipulation, putin on September 30, 2014 by Site Admin.